Hanukkah is a Jewish holiday celebrated for eight days and nights. It commemorates the rededication of the holy Temple in Jerusalem following the Jewish victory over the Syrian-Greeks in 165 BCE. Like many Jewish holidays, Hanukkah has accompanying food traditions. 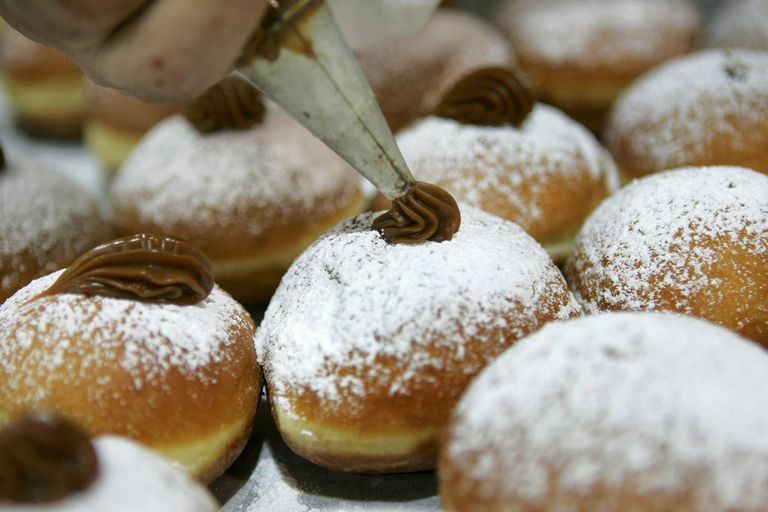 Fried foods like sufganiyot (jelly-filled doughnuts) and latkes (potato pancakes) are especially popular, as are dairy foods. The tradition of enjoying fried foods is really about the oil used to fry them. Hanukkah celebrates the miracle of the oil that burned for eight days when the Maccabees — the Jewish rebel army — rededicated the holy Temple in Jerusalem after their victory over the Syrian-Greeks more than 2,000 years ago. As the story goes, when the Jewish rebels eventually defeated the occupying forces, they reclaimed the holy temple in Jerusalem, but when they set about rededicating the temple, the Jews found they had only enough oil to keep the menorah lighted for one night. Miraculously, the oil lasted for eight days, giving the rebels enough time to distill more oil and keep the eternal flame lit. This legend is a familiar tale told at Jewish holidays. The fondness for fried foods during Hanukkah is in celebration of the miracle of the oil that kept a menorah lit almost 2200 years ago. Fried foods like potato pancakes (latkas in Yiddish and livivot in Hebrew) and doughnuts (sufganiyot in Hebrew) are traditional Hanukkah treats because they are cooked in oil and remind us of the miracle of the holiday. Some Ashkenazi communities call latkes asputshes or pontshkes. Dairy foods did not become popular on Hanukkah until the Middle Ages. The custom of eating foods such as cheese, cheesecake, and blintzes emerged from the ancient story of Judith. According to legend, Judith was a great beauty who saved her village from the Babylonians. The Babylonian army was holding her village under siege when Judith charmed her way into the enemy camp with a basket of cheese and wine. She brought the food to the enemy general, Holofernes, who happily consumed enormous quantities. When Holofernes eventually became drunk and passed out, Judith beheaded him with his own sword and brought his head back to the village in her basket. When the Babylonians discovered that their leader had been slain, they fled. In this way, Judith saved her people and eventually it became traditional to eat dairy foods in honor of her bravery. A version of the story is often read on the Sabbath during Hannukah. Several other foods are also traditional fare on Hanukkah, though they don't have the colorful history behind them — or at least not that we know about. Matzo ball soup. The balls of bread floating in chicken soup represent the unleavened bread that is a crucial part of Passover. Not a favorite of everyone, but still a traditional dish at Hannukah. Challah. This delicious baked bread is made from eggs rather than milk or butter and is often braided before baking. Gefilte fish. Many people are decidedly un-fond of these slimy balls of fish, yet a Hanukkah tradition they are. Sufganiyot. Deep-fried donuts filled with jelly and sprinkled with powdered sugar are a traditional Israeli treat. Rugelach. Small flaky sheets of dough filled with chocolate or cinnamon and baked to crispness. Delicious!